By default, parameters are passed to a method by value, which means that a copy of each parameter is made and passed to the method. Because the method works with a copy of the data, changes made to a parameter are not visible outside the method. Parameters passed by value can be thought of as input parameters. For example, assume that we have the following Bark method, which takes a parameter named barkPhrase. Notice that we attempt to change the value of barkPhrase before returning to the caller. 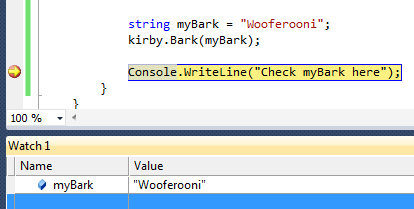 We can verify in the debugger that the myBark variable does not change when we call the Bark method.